Growing up in an Italian, Roman Catholic family, going to church on Sundays, receiving communion… it certainly has its influences. One evening of drinking the crazy idea of this cocktail came about. Trying to piece together how… its probably better off just left alone. 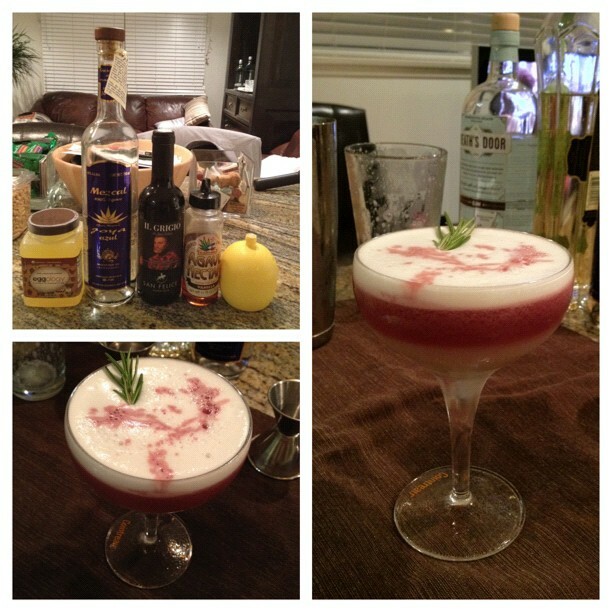 I basically took the idea of a New York Sour, which traditionally floats Red Wine atop a Whiskey Sour and went from there. I thought of making a sour using Mezcal (Mexico of course being another culture heavily influenced by the Catholic religion) and floating on top of it an Italian Red Wine; I chose a chianti. The smokey Mezcal representing hell/temptaion on the bottom, and the wine representing heaven… yada yada. Tags: Mezcal, Sour, Wine. Bookmark the permalink.